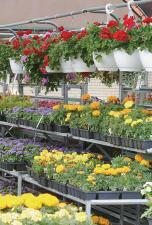 Edwards Flowerland and Floral is Northeastern Colorado's Largest Lawn and Garden and Nursery Center. Since 1984, we have provided simply the best flowers and vegetables available and a Nursery Stock with an inventory second to none in the area. Our horticultural experts can help you with all your lawn and garden needs. From the simple to the hard problems, we're here to help. If you can't find something you're looking for, give us a shout. If we don't have it, we will see what we can do about getting it for you. CLICK HERE to go to our Flowerland Website. Edwards Flowerland and Floral is also your full service Florist. From the occasional arrangement to weddings and funerals, we can help you with all of your floral needs. We also do holiday decorating with real garland and wreaths. Just give us a call, we can help.